The calories in an 8-ounce ribeye steak vary anywhere from 400 to 565 calories, depending on the type of steak. On top of that, if you use a tablespoon of oil to keep your steak from sticking to the grill, you'll add an extra 120 calories to your entrée. If you're concerned about calories, trim away all visible fat and use nonstick spray during cooking. You'll keep the calorie count of your ribeye steak as low as possible. An 8-ounce grilled beef roast boneless ribeye steak contains slightly more than 400 calories. If you get a ribeye cap steak, 8 ounces of cooked boneless meat give you nearly 560 calories. If you prefer bone-in ribeyes, you'll generally get more calories than the boneless varieties. 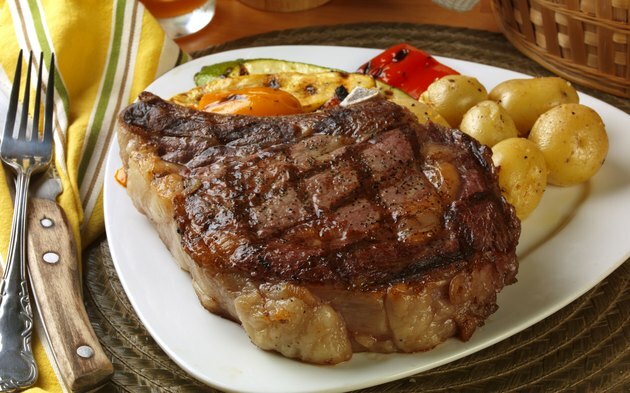 An 8-ounce broiled bone-in ribeye provides 565 calories. Not all ribeyes are beef, though. Select bison ribeyes as a leaner alternative. For an 8-ounce grilled bison ribeye, you'll get 400 calories.